Logomania is back, baby. We’re laying responsibility firmly at the feet of Virgil Abloh, Gosha Rubchinskiy, Supreme et al – and it’s been interesting to see how different designers have incorporated the desire for all things graphic into their new collections. The latest example? 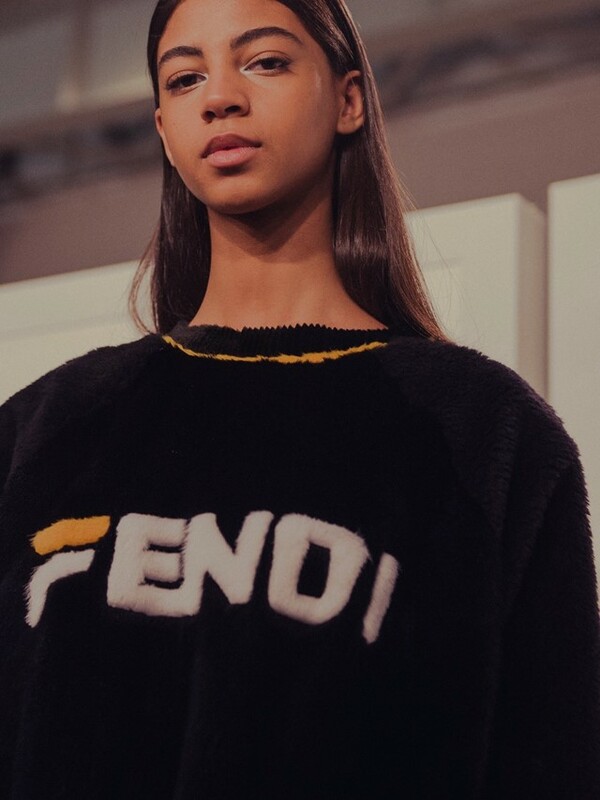 At Fendi’s AW18 show today, it riffed on the logo of Italian sportswear company Fila for a series of branded pieces – furry sweaters modelled by Kaia Gerber, Rocio Marconi and Loane Normand. The designs were the responsibility of Instagram artist @hey_reilly – known for his high-brow/low-brow logo mashups, including the aforementioned Fila flip which he first posted back in February last year. He first collaborated with Fendi last month (yes, it was somehow only a month ago) for the house’s menswear show. Then, the Scottish artist was given the logo and told to “just go berserk, go bananas” – creating collages which appeared on puffa coats and an FF ‘Family’ sweater. This time, he was just as happy to be teaming up with Karl and co. “I would like to thank Karl his team and everyone at Fendi for their generosity of spirit sense of humour and sheer panache for including a small part of my work in a small part of their collection. Love you guys forever,” he wrote on Instagram. Aww! Elsewhere in the collection, the monogram was front and centre (we told you it was back), there were cowboy boots, and Adwoa Aboah closed wearing a black velvet cape. There were also some v on trend small shades, although, surprisingly, they were not worn by Bella Hadid. Dazed cover girl Kris Grikaite sported a pair of the little oval sunnies though – keep your eyes on our Instagram story for a behind-the-scenes look at the show filmed by the model.